Holmes Family and Cosmetic Dentistry welcomes your youngest family members after their first birthday. We’ll teach them about oral health with a sense of fun thrown into the mix and help instill consistent oral hygiene practices that will grow with them into adolescence and adulthood. In addition to twice-yearly checkups with professional cleanings, Dr. Holmes offers sealants, fillings, and crowns for the younger set. We also offer family block appointments for your convenience. If you have questions or would like to schedule a pediatric appointment with Dr. Holmes, call or schedule below! Washing your baby’s gums with a soft, clean washcloth after feeding is recommended from birth onward to reduce oral bacteria from their mouths. 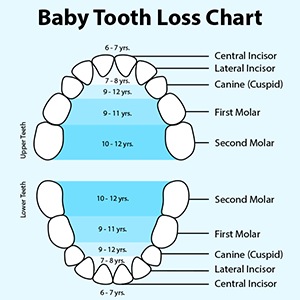 Teething commences from 3-9 months of age and can continue until the age of three years. When their first tooth emerges, begin an oral hygiene routine with an infant toothbrush and a tiny amount of infant toothpaste. Just how much toothpaste? Once your baby has two or more teeth touching, gentle flossing should begin, and it’s about time to make that first appointment with Dr. Holmes (if you haven’t already)! Brush and floss your child’s teeth for them until they can do so themselves. Kids can usually start to brush alone around age six, but you should still supervise. It may be beneficial to brush your own teeth beside them while you narrate (i.e. “I’m brushing in the back where germs could be hiding”). Motivating kids to brush—and to brush for the full recommended two minutes—can be a challenge. There are toothbrush timers, phone apps, and YouTube videos available that may help, and many of them are free. Consider creating original songs or games using an hourglass with sand or a timer with a ringing bell. Change it up; don’t be afraid to get silly and have some fun! 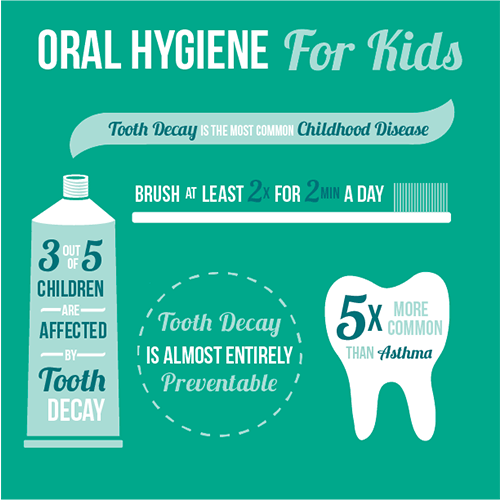 Poor dental hygiene in childhood can affect speech, eating habits, appearance, and self-confidence, and badly damaged teeth can lead to infection and even pain. While baby teeth have vanished by the time children reach their teens, tried-and-true early hygiene habits can grow along with kids throughout their lives. As children become older, they become more concerned about the appearance of their teeth. As kids approach adolescence, they may resist discussing oral hygiene with their parents. If this happens with your child, the team at Holmes Family and Cosmetic Dentistry is happy to remind kids about good nutrition and consistent oral hygiene to keep them looking and feeling their best. 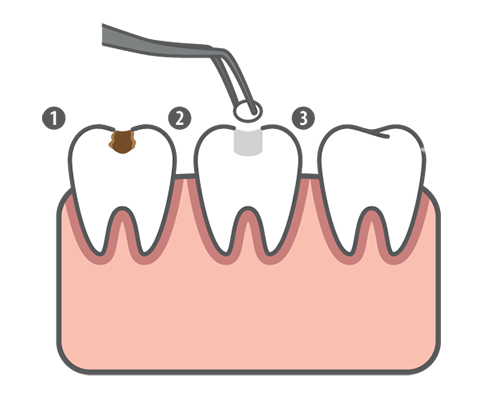 Sealants are a preventive measure to protect tooth enamel from decay, particularly in back molars. The thin plastic coatings fill in grooves of the tooth’s chewing surface. According to the American Dental Association, use of sealants on permanent molars can reduce cavity risk up to 80%. Dr. Holmes will discuss sealants with you and your child if he thinks they will help. Whether your little sugar monster can’t stop getting in the cookie jar (and getting cavities), they’re refusing to brush their teeth, or you just want to prevent decay before it starts, sealants are one of our favorite tools in our dental tool belt. Prevention is the best medicine, after all. Sometimes a tooth becomes damaged and needs a little rebuild. Depending on the cavity’s size and location, filling or crown restorations can bring a child’s tooth back to full strength and function. Dr. Holmes color-matches crowns and fillings to match a child’s natural teeth beautifully. We’ll work with your family to keep growing grins at their healthiest. If you have any questions or would like to schedule an appointment with your Fort Wayne children’s dentist Dr. Ryan Holmes, call or schedule an appointment online below!